I'm using MonoGame 3.7 AFAIK. Will update if that turns out to be wrong. This error occurs if I'm running it on older computers (So far it's occured with systems with OSes older than Windows 10). 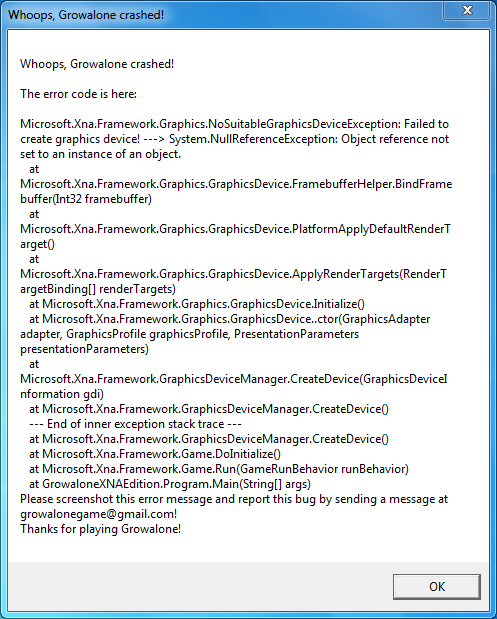 Growalone is the name of my game and people are experiencing problems. When the game was made using XNA, it wasn't an issue. But this all started when I ported the game over to MG in VS2017. On my dev PC, it works fine, but on this one it does not. If anyone can help, thanks! Which type of project is the game in (Ex. DesktopGL, WindowsDX)? DesktopGL is the project type. Sorry for not providing that too! DesktopGL projects require OpenGL 3.0, which some older GPUs do not support. For those cases, you can provide a WindowsDX version using the Reach profile, which supports DirectX 9 and up (provided any shaders written are compiled with the appropriate level), which is what XNA uses. This should fix the problem for your Windows users. If your project isn't set up to handle multiple platforms, you can get it up and running in relatively little time via file linking in VS. This video does a great job describing it.